Our dental care Master Plan for your overall dental health begins with a dental fitness risk assessment. The most common reason that people lose teeth past the age of 35 is gum infection and diseases that attack the supporting structures of the teeth. The good news is that dental decay and gum disease are almost 100% preventable and often reversible. Our dental fitness risk assessment helps us determine the degree of health or disease that is present in your mouth today. We come away with a clear understanding of the preventive measures that you and our office can take to stop the progress of disease. Our goal is to help you have healthy teeth and gums for the rest of your life. Our risk assessment measures the amount of plaque in your mouth, tooth by tooth. We also note bleeding and gum recession. 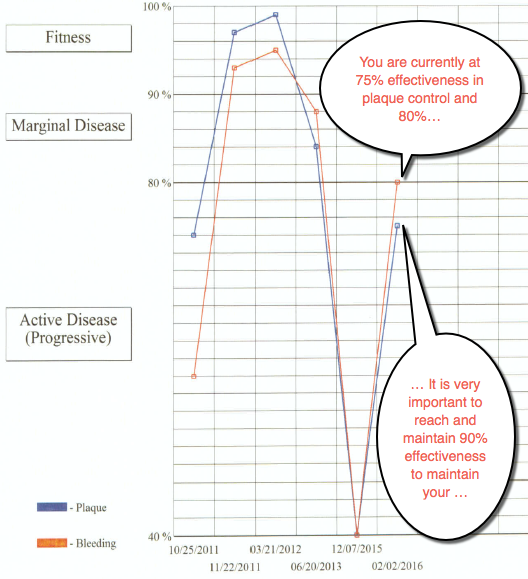 You will receive a percent effectiveness score for both plaque control and bleeding control. We will then show you healthy dental practices, such as how to brush and floss correctly, and which areas of your mouth need a little bit more attention. If you have the beginnings of tooth decay, we will help you prevent more decay and even naturally reverse it. We offer several solutions from recommending changes to your diet, special mouthwashes and topical pastes. During your next dental exams, we will track and discuss your progress. Click here to view a sample Dental Fitness Risk Assessment. If you are interested in dental fitness and preventative dentistry, Gary A. Grablin DDS, looks forward to helping you. Please call: (415) 454-3222 to set up an appointment.